Hi, I am a new member to this forum. I am currently running a 2001 tiptronic 996TT with DMS chip, EVOMS diverter valves and silicone boost tubes, Techart Formula wheels, and Europipes exhaust and I was thinking of swapping my existing brakes and discs with those from a 997TT. Does anybody have any experience with whether this can be done and any opinions? not sure why you would want to do this. I'm sure it can be done, but at what cost? Are you exceeding the capacity of the big reds? If so, 6pot options from tuners may be a better choice than another OEM offering.....the way I would go. Welcome. Lots of us have upgraded brakes and you have a variety of options. to be a significant gain in pad life, heat dissapation, fade resistance, etc. How are the roads in Singapore for driving a turbo Porsche?? Leslie! Wellcome to the Six! Are you going to swap a set of 997TT's PCCB? Hey guys, thanks for all the quick response. Well, the reason I am asking is that I have got a full set of 997 turbo brakes and discs from a friend who just put in ceramics and since they are 6 pots I figured they ought to be better than the stock ones I have on. Since you guys have put in after market 6 pots, did you have to modify a lot or are the mounts compatible? I do track the car and since the DMS chip and EP exhausts would have pushed the power to >500 BHP it should make a lot of sense to have better stopping power. Marty, fyi Singapore roads are terrible for the turbo...zero tolerance from the cops and you stand to lose your licence if caught going 60kph above the speed limit. A lot of us do our fast drives on the Malaysian F1 Sepang race track up north. I also would like to know what you guys would do to keep the front end from becoming a bit "floaty" at speeds above 280 kph (175mph) err...hypothetically of course..
this is what i did to help with the front end. best money i have spent on the car thus far. leslie, I'm not sure if the 6pots on the 997 TT are the same as the ones on the 996 GT2 but if they are they are MUCH better than the factory big reds. They dissipate heat better, and last much longer. 6 pots are still better than the 4 pistons either way you look at it. As long as yo udont have to do much modifying I say do it. But also keep in mind if you have to modify the rotors (machine them), you'll have to do it everytime you get a new set. the aerodynamics of these cars is designed to generate MORE down force as the speed increases. My experience above 160-170 (at Daytona) is that you can feel the car being pushed down. if your car is "floaty" at speed something may be wrong with your suspension. as for the brakes, if you can do the swap they are an upgrade. 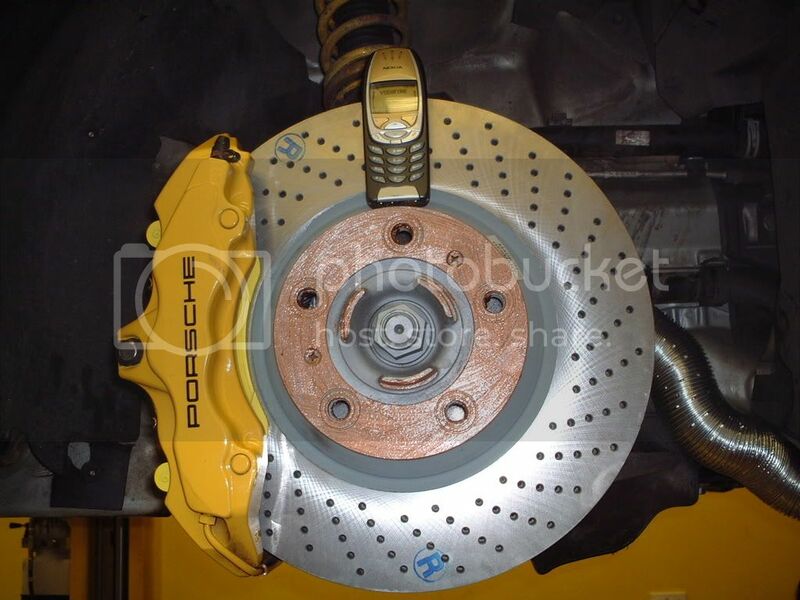 Dont quote me on this, but i'm pretty sure the current 997 6 pot calipers are a bit a larger than their predecessors, the 996 GT2/3. It's subtle but you can tell the 997 CCB caliper is a tad larger, and i believe the current CCB trend follows the same pattern as the older 996 CCB system which (to my knowledge) utilized the same calipers between the CCB and steel systems. With this, i think upgrading to the current big reds (considering the fit well) would be a good way to go. Yeah, the 997 uses 19" wheels while I still have 18" on mine. Hope there's enuff clearance for everything to go in. 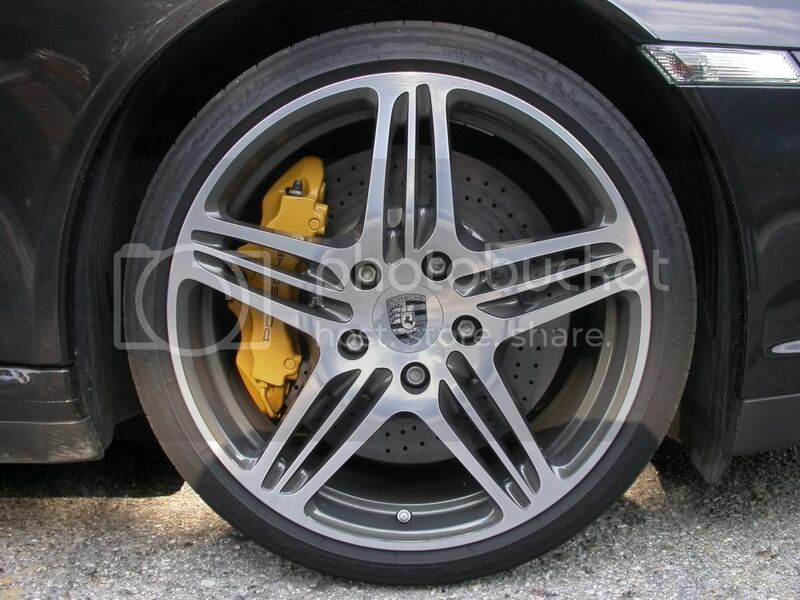 At least the Techart Formula spokes have a fair bit of lateral space. Will let you guys know in a few days. To assist in not floaty, lower your car and have correct suspension set-up. Mine felt completely stable at 190 mph plus.